The Art Show is a silent auction where you can bid and win your favorite piece. The Art Show contains a variety of original art and fan art in different mediums. Pieces range from paintings to prints to sculptures. 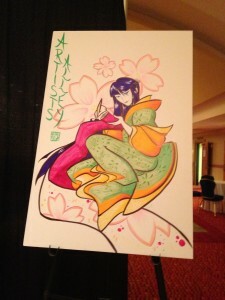 Interested in displaying your artwork at the upcoming Anime USA convention? Learn more about the art submission process.